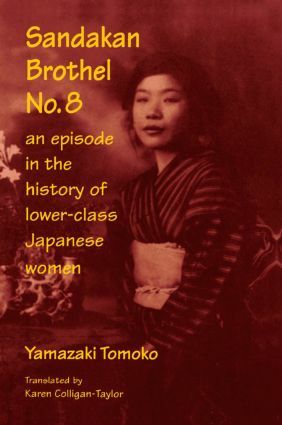 This is a pioneering work on "karayuki-san", impoverished Japanese women sent abroad to work as prostitutes from the 1860s to the 1920s. The narrative follows the life of one such prostitute, Osaki, who is persuaded as a child of ten to accept cleaning work in Sandakan, North Borneo, and then forced to work as a prostitute in a Japanese brothel, one of the many such brothels that were established throughout Asia in conjunction with the expansion of Japanese business interests. Yamazaki views Osaki as the embodiment of the suffering experienced by all Japanese women, who have long been oppressed under the dual yoke of class and gender. This tale provides the historical and anthropological context for understanding the sexual exploitation of Asian women before and during the Pacific War and for the growing flesh trade in Southeast Asia and Japan today. Young women are being brought to Japan with the same false promises that enticed Osaki to Borneo 80 years ago. Yamazaki Tomoko, who herself endured many economic and social hardships during and after the war, has devoted her life to documenting the history of the exchange of women between Japan and other Asian countries since 1868. She has worked directly with "karayuki-san", military comfort women, war orphans, repatriates, women sent as picture brides to China and Manchuria, Asian women who have wed into Japanese farming communities, and Japanese women married to other Asians in Japan. The collapse of the Soviet Union had the additional effect of demolishing the international political order of the past half-century, with consequences for all sides. International actors no less than leaders in the region had to reorient themselves to a new world, knowing that their actions might impact the developing situation in unexpected ways. This concluding volume of the "International Politics of Eurasia" series takes on the challenge of specifying the forces at work in the international environment of Russia and the New Independent States and gauging the impact of external actors on developments in this region. Among the topics covered are foreign and security policies; relationships with East Asian, Near Eastern and Western states; and the impact of international economic and financial institutions, development assistance and advisory programmes of various kinds and aid organizations.